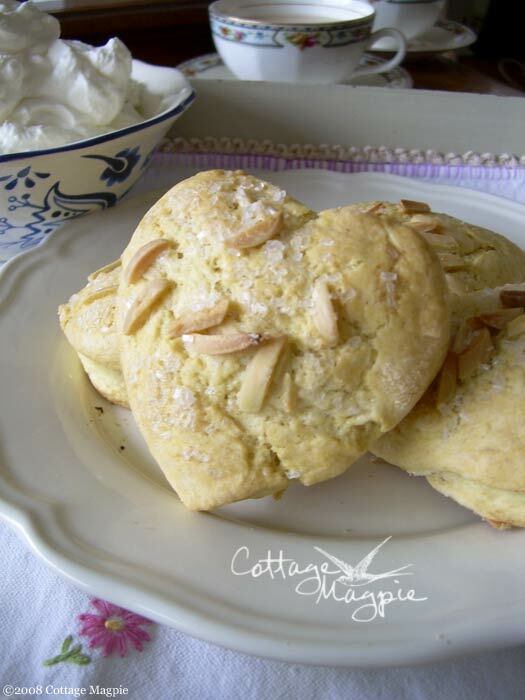 A favorite treat in my house is my own heart-shaped almond sweet biscuits. I've been told this is actually a scone, but having never had a proper scone, I just call it a sweet biscuit. Whatever you call it, these are easy to make and perfect for tea with a friend. The key to a good biscuit is to work quickly so the butter stays cold. If it gets soft, it will absorb into the flour, making tough biscuits. If it stays cold, the bits of butter will flatten out with the dough and create those flaky layers we all love. So lay your ingredients all out before beginning. As for fat, butter gives the best flavor, but shortening provides the better texture, so I choose to use half of each. You can use all one or the other if you prefer, but avoid margarine as the high water content will make for tough biscuits. If you need a butter alternative, I have successfully used Earth Balance buttery sticks. As a final note, I use almond milk in this recipe, which is a "milk alternative" made from almonds and water. I find it gives a great texture and adds to the flavor, plus is better for my milk avoiding husband. But you can just use milk or water instead with good results. 2. In a medium-sized bowl, stir the flour, salt, baking powder, baking soda and sugar, then drop the butter and shortening on top in tablespoon-sized lumps. 3. Cut in the butter and shortening until you have a mix of bits smaller than peas. Use a dough cutter if you have one, or two knives if you don't. I get better results if I make these by hand, so I don't use a food processor. 4. Add 3/4 cup of the almond milk, almond extract and egg. Mix until well moistened. You should have a fairly wet, sticky, lumpy ball of dough. 5. Turn out the dough on a well-floured board and pat it out flat. Fold it in half and in half again, then pat it out again. You will need to add flour to prevent sticking. Repeat four or five times, then pat or roll the dough out to about 1/2" thick. 6. Cut into shapes and lay out on a baking sheet. I recommend a plain, shiny metal pan for best results. The dark nonstick pans tend to burn, so if you use one, watch carefully. 7. Brush the tops of the dough with the remaining almond milk, then sprinkle with slivered almonds and sugar. 8. Place the finished pan of biscuits in the middle rack of the oven to bake at 450 degrees. 9. Bake until golden brown and crispy. This will take anywhere from 12-20 minutes depending on your oven, the humidity, and how wet your dough is. 10. Cool on a wire rack, then split and eat with jam or cream. Yum!